Earlier this summer my husband started a new job at What Cheer. One morning the What Cheer crew went into work early, I mean at the office before the birds were chirping early. I knew they were working hard and wanted to make sure they had a breakfast treat to help fuel their morning. I’m a sucker for cinnamon rolls, especially when they are homemade and fresh from the oven. I think I have the best recipe with pudding in the mix. I couldn’t whip up a batch of my cinnamon rolls to share with the What Cheer gang, because they contain gluten. If I were to deliver a batch of freshly made cinnamon rolls that everyone could eat they would have to be gluten free. Google led me to a gluten free forum that had a promising recipe in one of its discussions. The recipe is from the cookbook Eating Gluten Free. 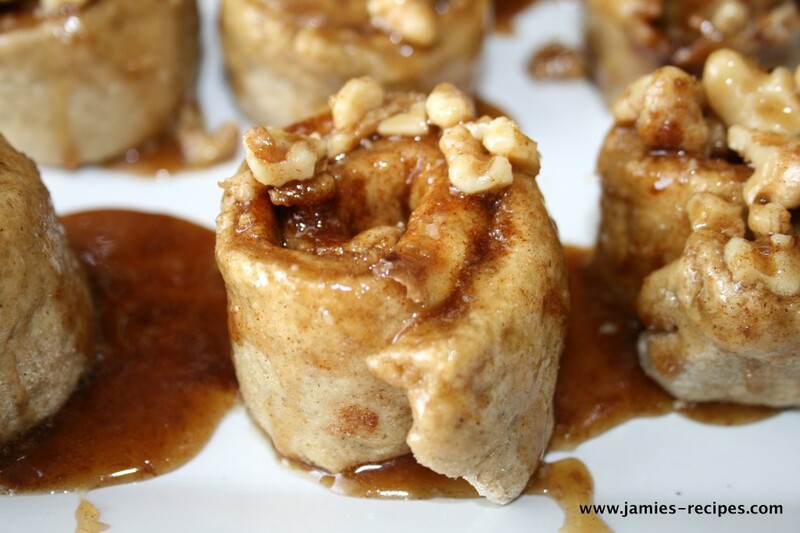 These cinnamon/sticky buns tasted so wonderful you would never know that they gluten free. JH had lived 27-ish years without ever knowing the joy of tasting a warm cinnamon roll. I was so happy to bring these to What Cheer -still warm from the oven. He asked if this is what “real” cinnamon rolls tasted like, and everyone said “YES!” If you have gluten intolerant friends, I beg you to please make these for them. They are wonderful! Combine the yeast and warm (NOT HOT!) water in your mixing bowl. Set aside to let it do its magic. In a separate bowl, combine the 1 cup sorghum flour, cornstarch, tapioca and Xanthan, stir to combine. In a small bowl, combine the oil, honey and milk. Stir into the yeast. Add the salt and the egg. Turn on the mixer, and gradually add the flour mixture. Once it is all added, mix vigorously for 10 seconds. Cover the bowl loosely with plastic wrap and rise in a warm place for 30 minutes. It doesn't rise a whole lot, like with traditional cinnamon rolls, but you should notice some rise in the dough. Combine your butter, sugar, and cinnamon for the filling. Set aside. After the dough has risen, dust your work surface, hands and the dough with the reserved sorghum flour. Knead the dough several times until it is all combined. It seems like a lot to be adding, but it really does soak it all up. If the dough is still really sticky, you may need to add more sorghum flour. Roll dough out into an 8 x 12 rectangle. Spread the reserved butter mixture over the dough. Roll into a long tube. Slice tube into 1 in individual rolls. Place rolls on a parchment lined jelly roll pan. Cover and allow to sit and rise for 1 hour. Make sticky bun topping. In a sauce pan over medium heat melt butter, honey, and sugar until sugar is dissolved, about 1 minute. Pour topping into a greased 9 x 13 pan. Sprinkle chopped nuts over the mixture. Once cinnamon rolls have risen, place in 9 x 13 pan and bake for 15 minutes. 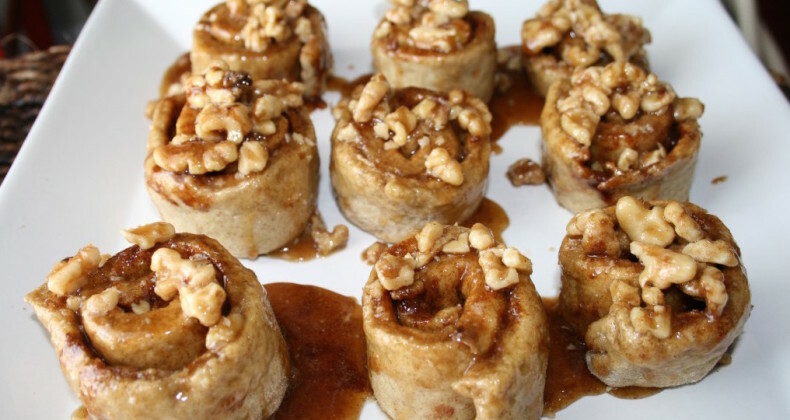 Turn the rolls over on a platter and spoon on any left over walnuts and honey syrup. Eat them while they are hot. ENJOY! Do you know if it’s possible to replace the egg with something? I have gluten allergy since childhood. I am always on a Gluten Free diet and i use guar gum in some of may baked foods. These look heavenly!! And I love that they don’t use rice flour. Great job!